Chicago, Rome, Anchorage RunFest, so many others! Never limit where running can take you. In my 30’s, I discovered I was pretty good at running after being “the last one picked” for everything sports growing up. I have met so many good friends and have been able to see some great places for races. I typically train with a group, but I find running alone peaceful & relaxing. Running up Michigan Avenue in the last couple miles of the Chicago marathon, my first marathon – I knew I was not going to reach my sub-4 goal, but I knew I was going to finish my first marathon by running across the finish line! Anchorage Run Fest – my first time with an “overall” placing (2nd female), I got lots of shout-outs, “good jobs” & other acknowledgements of my running “cred” from other runners on the course. Not a marathon, but the Cabo half marathon was a blast, even the “Kills” (2 killer hills in a row around mile 8). I was so excited to get a PR that I almost forgot to get a medal. They had a podium presentation for age group awards & gave all AG placers a trophy, compression socks & a bottle of champagne. I had such a great time in my first marathon and have learned a lot since then that I want to share with newer runners. I love seeing runners achieve their goals. I was running the Des Moines marathon a week after PRing in Chicago so I wanted to go easy. There wasn’t a pace group for my goal time, so after 3 miles I decided to go ahead of the 4:25 group. I met another guy with the same goal so I offered to help him to that goal. We ended up running the entire rest of the race together. When he hit the wall and I was still feeling great, I offered him encouragement, gels, water, etc. and pushed him to continue. He ended up PRing by 28 minutes! My first summer pacing for the CES marathon training program, I had several first time marathoners. It was fun guiding them through the 20 week program and seeing them at our pre-race meeting place. After the race I found out one of them had beat me by several minutes. One of the coaches got a picture of our hug; I was genuinely happy. So proud of him! He is now a fellow pacer for our training program and continues to amaze me as he PRs consistently at various distances. I’ll keep you company during the 26.2 miles so you’ll forget that this is work. 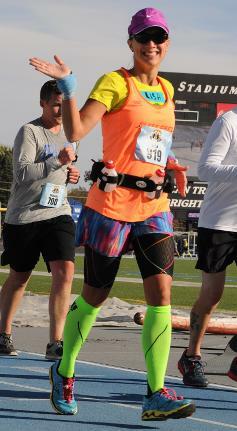 And I’m colorful – I try to wear as many colors in my race attire as possible. Don’t go out too fast (I’ll help with that). Enjoy the experience of the race, especially if it’s your first. Get high 5’s from as many kids (and senior citizens) as possible and thank the volunteers. Life is better in color! I have volunteered with PAWS in Chicago to help homeless kitties & cats. I always want to take them all home.